My research involves using satellite data to accurately measure the slow movement of the ground around a large earthquake generating fracture in Northern Turkey. This fracture is called the North Anatolian Fault. Over time slow tectonic movements store up energy on these faults, which are released suddenly in earthquakes. The aim of my PhD is understand how the slow warping of the ground measured from space can be used to calculate the amount of energy being built up on the North Anatolian Fault and explain how this may change over time. The North Anatolian Fault Zone (NAFZ) is a major continental strike-slip fault system located in northern Turkey. This fault slips with an average speed of 20-30 mm/yr and is the main focus of deformation on the northern edge of the Anatolia region as it moves westwards towards the Hellenic subduction zone. 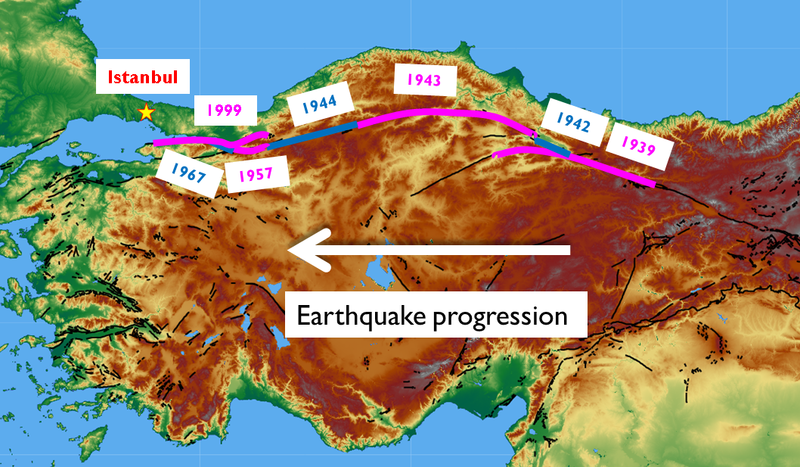 The fault accommodated 12 large earthquakes (M6.7 and above) since 1939 with a dominant westward progression in seismicity; the last being the 1999 M7.4 Izmit earthquake just east of Istanbul. This poses a large hazard for a future strong earthquake around the Istanbul region. These past ruptures provide us with an unique window into different stages of the earthquake cycle along the same strike-slip fault. My PhD research uses well established Interferometric Synthetic Aperture Radar (InSAR) techniques to monitor interseismic ground deformation along the entire NAF. The aim is to spatially map variations in strain accumulation along the fault and relate this to different stages of the earthquake cycle. My research will enable us to better understand the variations in strain accumulation during the earthquake cycle and will be an essential component in future seismic hazard and risk assessments. The research is part of the FaultLab project which is a large multinational and multidisciplinary project led by researchers at the University of Leeds to develop a crustal scale model of the NAFZ that is consistent with geological, geodetic and seismological data. Getting ready for the next big one, feature article in NERC’s Planet Earth magazine Summer 2014 edition, web version. Chapter 1: Natural Hazards, in Hazards and the Himalaya, 2014. Booklet used to teach children and locals about natual hazards in Northern India.